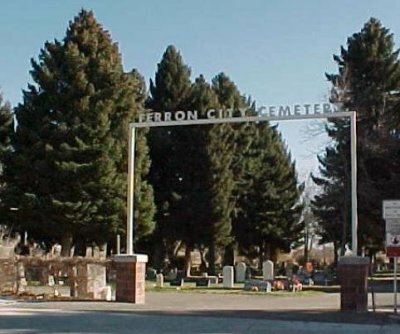 Ferron City Cemetery is a sacred and hallowed ground. As you walk through our cemetery we hope that you will feel the peace and tranquility of this special place. May your mind return to the fond memories you have of your loved ones and may you come back often to keep the love and memories alive. It shall be unlawful for any person to erect or maintain any fence, corner post, coping or boundary of any kind, to place benches, to plant any shrubs or trees upon any lot or lots, street, alley or walkway in the cemetery or to grade the ground or land thereof without first obtaining approval from the city council and cemetery groundskeeper. The maintenance department shall, whenever required, furnish the true lines of any lots according to official survey, shall prevent and prohibit any markings of the same except by official landmarks, and shall prevent and prohibit any grading thereof that might destroy or interfere with the general slope of the land. There shall be no more than one body buried per plot or single gravesite. The practice commonly known as “piggybacking”, wherein one body is buried directly above another, shall not be allowed. It shall be unlawful to piggyback” or bury an urn on top of another grave or to the foot of an existing grave. The base or footer of a single headstone or marker shall be smaller than four feet (4’) in width to avoid interference with adjoining plots. 1. No marker, monument, item or structure of any kind may be placed in the cemetery that is not dedicated to the memory of an actual, named deceased human being. 2. If any marker, monument, effigy, or other item or structure of any kind or any inscription thereon is placed on any lot, is deemed by the city to be of an offensive nature, unsightly or improper, the city reserves the right to remove, at the expense of the grave space owner, or request the grave space owner to remove, correct or repair the problem within the time designated by the city.